On June 5, 1981, the Centers for Disease Control and Prevention reported on cases of Pneumocystis pneumonia that afflicted “5 young men, all active homosexuals,” in Los Angeles.This report marked the beginning of public knowledge about the AIDS epidemic. What the report didn’t include was two other cases of the mysterious pneumonia – the first afflicting a gay African-American man, the other, a heterosexual Haitian man. This early omission of race was reflected throughout reporting during the HIV/AIDS crisis; historically the narrative focus has been on how the HIV/AIDS epidemic affected gay white men, while the experiences of American black and brown people with HIV/AIDS have been under documented, ignored, or written out of history. In fact, the first case of HIV/AIDS discovered in the United States was Robert Rayford, a 16 year old black teenager from St. Louis, Missouri who died in 1969. The story of his sickness and death, reported on in 1987, was eclipsed by the now disproven “Patient Zero” narrative that French-Canadian flight attendant, Gaëtan Dugas was the first person to bring HIV into the United States. The time of mass HIV/AIDS deaths in the United States is largely behind us. A combination drug treatment, known as the AIDS cocktail, was discovered, leading to dramatic improvement in managing in HIV infection. After the introduction of the cocktail, the number of new AIDS-related deaths began to drop, starting in 1997. Today, HIV is a chronic condition for those with access to highly active antiretroviral therapy. Despite the discovery of the cocktail more than 20 years ago, HIV/AIDS continues to disproportionately affect African American and Latino men. According to the CDC, in 2016, African Americans accounted for 44% of HIV diagnoses, while Latinx people accounted for 26% of HIV diagnoses. Among Latino men, 85% of diagnosed HIV infections were attributed to male-to-male sexual contact, while more than half of African Americans (58%) who received an HIV diagnoses identified as gay or bisexual. The higher levels of HIV infection in black and brown communities of color is attributable to systemic bias, discrimination, structural racism, and lack of access to education and care. To face this ongoing crisis, we must acknowledge history and stories that have been hidden, and discuss how these histories can inform our current responses. Diagnosed with AIDS in 1985, Wilfred continued to live his life to its fullest. His great sense of humor and admiration for living allowed Wilfred to deal with the many challenges and the changing circumstances precipitated by AIDS. He enjoyed traveling, especially to his native Puerto Rico, and spending summers in Provincetown as well as dining out. Today we remember Wilfred Colon Augusto, a member of the Harvard Medical School community, and a person whose story and experience should not be lost to history. The Center also holds oral history interviews and transcripts with hemophiliac men who were patients at the Boston Hemophilia Center, available on OnView. Bernice Ende, lady long rider and great-nice of Linda James Benitt, the first woman to graduate from the Harvard Chan School (then known as the Harvard-MIT School for Health Officers) shared photographs of Linda’s parents, as well as anecdotes on her early life. 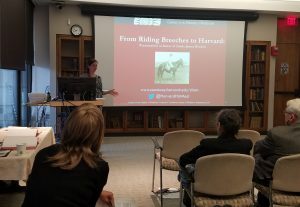 The Center for the History of Medicine was delighted to host the event, “From Riding Breeches to Harvard” on Wednesday, September 20th at the Countway Library. Bernice Ende, great niece of Linda James Benitt, who was the first woman to graduate from the Harvard T.H. Chan School (then the Harvard-MIT School for Health Officers), presented findings, photos, documents, and stories from her research on, and relationship with, her “Aunt Linda.” Ende, a lady long rider for over thirteen years, has credited both her mother and her aunt for inspiring her life-long desire to encourage female leadership through long riding. Dr. Joe Brain, Cecil K. and Philip Drinker Professor of Environmental Physiology, Department of Environmental Health, and Chair of the Harvard Chan School Archives Advisory Committee, welcomed the intimate crowd and shared his experiences working with the committee and the Harvard Chan School Archivist, Heather Mumford, in uncovering the early history of the school. 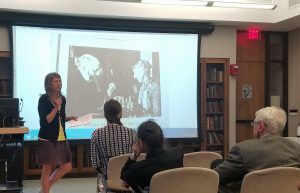 Heather Mumford, Archivist for the Harvard Chan School, presented on her 2013 “discovery” of Linda James Benitt, the first woman to graduate from the Harvard-MIT School for Health Officers (precursor to the Harvard Chan School). Prior to Ende’s presentation, Joan Ilacqua, Project Archivist for the Archives for Women in Medicine, provided background information on the first women on the Harvard Longwood campus, with a nod to Linda James Benitt’s being the first woman to be credentialed on the same basis as men in 1917 by the Harvard-MIT School for Health Officers. Following Ilacqua’s presentation, Mumford spoke on her discovery of Linda James Benitt in 2013 during the school’s centennial. The results of her early research, primarily conducted through the Minnesota Historical Society, resulted in a two-part blog series, available here. Ultimately these blog posts were what connected Mumford and Ende, and sparked their correspondence over the next three years. The James family, circa 1920. Photograph courtesy of Bernice Ende. During her presentation at the Countway, Ende shared family photographs, letters, clippings, and anecdotes which helped paint a more well-rounded perspective of Linda James Benitt, and followed her throughout her life at Harvard and beyond. 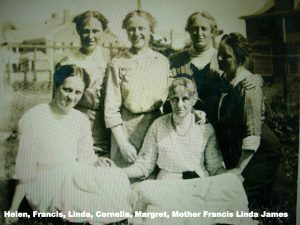 Common threads, such as a love of horses, a dedication to fighting for women’s rights and highlighting the accomplishments of women, as well as cultivating opportunities for adventure, were also discovered for the first time during the course of her research, and have led Ende to a much deeper appreciation for her great aunt. Ende has written a book on these topics, which is anticipated to be released in 2018. As a very special treat, Bernice Ende’s older sister brought and displayed family photos and artifacts for the audience to enjoy. 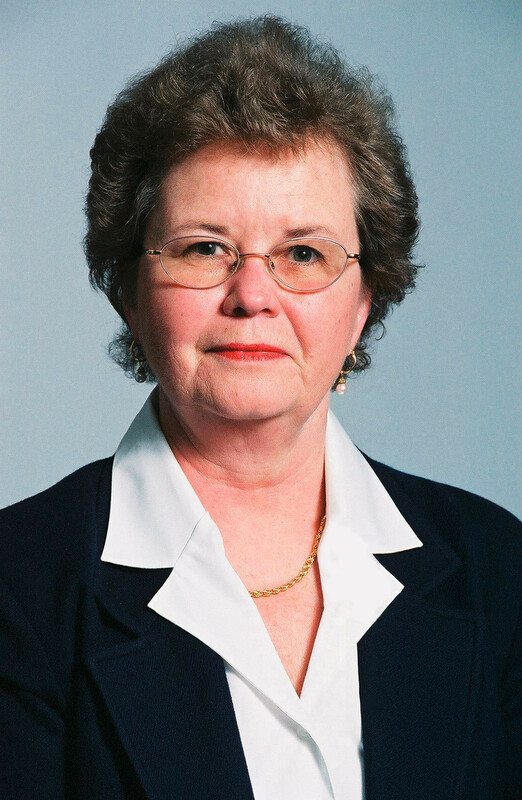 The Center for the History of Medicine is pleased to announce that the papers of Marie C. McCormick, 1956-2016 (inclusive), 1968-2009 (bulk), are now open to research. McCormick is the Sumner and Esther Feldberg Professor of Maternal and Child Health in the Department of Social and Behavioral Sciences, Harvard T.H. Chan School of Public Health; Professor of Pediatrics at Harvard Medical School; and Senior Associate for Academic Affairs in the Department of Neonatology, Beth Israel Deaconess Medical Center. Her research has primarily focused on epidemiology and health services, particularly in relation to infant mortality and the outcomes of high-risk and very low birth weight neonates. She served on all four phases of the Infant Health and Development Program (IHDP), the largest longitudinal multisite randomized trials of early childhood educational intervention for low birth weight and high-risk infants, and was the Principal Investigator of Phase IV of the program. She was also a senior investigator on both the federal Healthy Start Program and the Robert Wood Johnson Foundation National Perinatal Regionalization Program. She served as Chair of the Institute of Medicine’s (now National Academy of Medicine) Committee on the Health Effects of Marijuana, and its Immunization Safety Review Committee, for which she testified twice before the U.S. House of Representatives on the lack of evidence linking vaccinations with autism (2001 and 2004). In 1996, she also testified before the U.S. Senate on the National Healthy Start Initiative. She has published 12 books and monographs, as well as over 280 scientific papers, reviews, editorials, reports, and abstracts. Writings and publications related to maternal and child health, epidemiology, regionalization of care, and other topics in public health. The collection was processed as part of the Bridging the Research Data Divide project, funded by a Hidden Collections grant administered by the Council on Library and Information Resources. For more information on the project, please contact the project’s principal investigator, Emily R. Novak Gustainis, Deputy Director of the Center for the History of Medicine. For more information on McCormick’s collection, please view the online finding aid: http://nrs.harvard.edu/urn-3:HMS.Count:med00244. 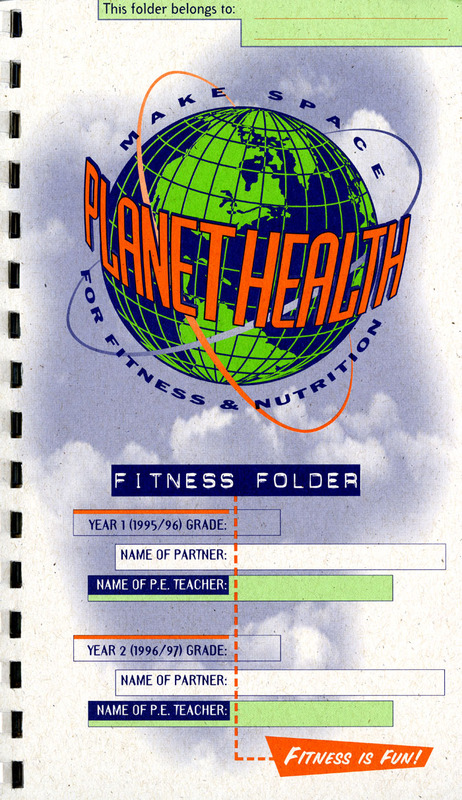 Fitness Folder, from the Harvard Prevention Research Center’s Planet Health Curriculum. P-DT08.01, Series 00598. From the Harvard Medical Library in the Francis A. Countway Library of Medicine. The Center for the History of Medicine is pleased to announce the opening of two collections: the records of the Harvard Prevention Research Center (HPRC) and the papers of the HPRC’s Director, Steven L. Gortmaker. The Harvard Prevention Research Center on Nutrition and Physical Activity was founded in 1998 at the Harvard T.H. Chan School of Public Health, to work with community and governmental organizations in the research, development, and implementation of school- and community-based youth intervention programs to encourage better health habits. The HPRC has conducted a number of intervention research projects, including: the randomized control trial of the Planet Health curriculum, which is used in middle schools to teach healthy decision making about nutrition, exercise, and leisure activities; and the Play Across Boston project, which surveyed and evaluated the availability of afterschool fitness programs for Boston-area youth, and studied how access and individual family characteristics influence youth physical activity. The HPRC records include administrative records and research data for both Planet Health and Play Across Boston. Planet Health records include student fitness questionnaires, television viewing worksheets and graphs, financial records, Wellness Workshops administrative records, and student participation records. Play Across Boston records include: student surveys (concerning health and exercise habits, demographics, access to fitness programs, and other topics); and fitness program provider surveys (concerning program details, cost and accessibility, and participant numbers and demographics). Steven L. Gortmaker, M-AD06. From the Harvard Medical Library in the Francis A. Countway Library of Medicine. In addition to directing the HPRC, Steven L. Gortmaker is Professor of the Practice of Health Sociology in the Department of Social and Behavioral Sciences, Harvard T.H. Chan School of Public Health. His research focuses primarily on the health and mortality risks affecting children and adolescents (particularly low-income and minority), and interventions for mitigating those risks. He served as Principal Investigator on a number of HPRC initiatives, including Planet Health, Play Across Boston, the Out of School Nutrition and Physical Activity Initiative (OSNAP), and is also Co-Director of the Childhood Obesity Intervention Cost-Effectiveness Study (CHOICES). 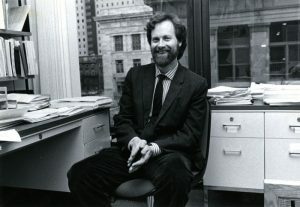 In 1997, he was awarded the Robert Wood Johnson Foundation Investigator Award in Health Policy Research. Gortmaker’s papers comprise his research and teaching records generated during his career. The collection includes research data and administrative records from a number of projects, including: an obesity research project using data from the National Health and Nutrition Examination Survey; the Robert Wood Johnson Foundation’s Rural Infant Care Program; and organ donation research for the Partnership for Organ Donation. The papers also include Harvard T.H. Chan School of Public Health teaching records for courses related to HIV, social behavior, and statistics. The collections were processed as part of the Bridging the Research Data Divide project, funded by a Hidden Collections grant administered by the Council on Library and Information Resources. For more information on the project, please contact the project’s principal investigator, Emily R. Novak Gustainis, Deputy Director of the Center for the History of Medicine. More information on the collections may be found in their online finding aids: http://nrs.harvard.edu/urn-3:HMS.Count:med00242 (Harvard Prevention Research Center Records); and http://nrs.harvard.edu/urn-3:HMS.Count:med00243 (Steven L. Gortmaker papers). Faculty members of the Harvard School of Public Health Department of Maternal and Child Health, reading a Growth Study Case History. 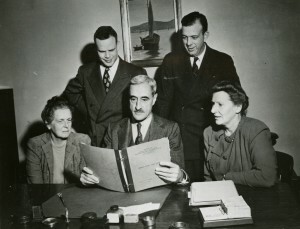 Seated: Bertha S. Burke, Harold C. Stuart, and Elizabeth P. Rice. Standing: Samuel W. Dooley and Samuel B. Kirkwood, circa 1949, H MS c450. From the Harvard Medical Library in the Francis A. Countway Library of Medicine. The Center for the History of Medicine is pleased to announce that the records of the Harvard School of Public Health Longitudinal Studies of Child Health and Development, 1918-2015 (inclusive), 1930-1989 (bulk), are now open to research. The longitudinal studies, otherwise known as the Harvard Growth Study, were founded in 1930 by Harold Coe Stuart (1891-1976) in the school’s Department of Maternal and Child Health. It was one of several United States growth studies that were initiated in response to a recognized lack of knowledge about child health and development. The original study enrolled 309 prenatal subjects between 1930 and 1939, 134 of whom were followed through to maturity (18 years). Researchers tracked subjects’ health, physical development, diet, and social and psychological functioning. The data from this and other growth studies were used to create pediatric growth curves and percentile charts that became the standard used by pediatricians across the country. 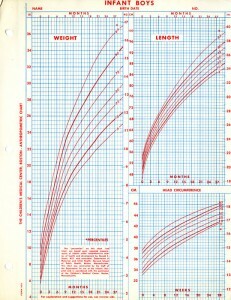 Infant boys anthropometric growth chart, created with data from the Harvard School of Public Health Longitudinal Studies of Child Health and Development. From the Harvard Medical Library in the Francis A. Countway Library of Medicine. Recognizing the reuse potential of the rich data collected during the original study, investigators periodically called subjects back for more targeted follow-up studies over the following decades. A 30-year follow-up study on adult health related to child health was conducted between 1960 and 1969; a 40-year follow-up on blood pressure and cardiac health was held between 1970 and 1979; and two 50-year follow-up studies on gynecology and memory of diet in the distant past took place between 1980 and 1989. The records comprise research data from the original and all four follow-up studies. There is a variety of data types and formats, including: physical examinations and medical records; anthropometric measurements and growth curves; progressive somatotype photographs; somatotype family trees; nutrition and diet surveys; social work interviews and reports; and various medical test results. The data is accompanied by methodologies, protocols, codebooks, reports, grant files, subject participation records, personnel records, and related administrative records. The collection also includes manuscript drafts and publications composed by Growth Study staff members, and collected publications, brochures, and pamphlets related to maternal and child health. 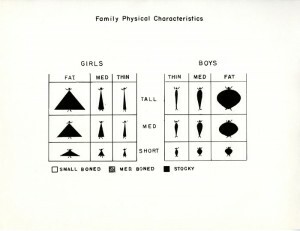 Family Physical Characteristics Key, created during the Harvard School of Public Health Longitudinal Studies of Child Health and Development. From the Harvard Medical Library in the Francis A. Countway Library of Medicine. This is the first of four collections to be processed under the Bridging the Research Data Divide project, funded by a Hidden Collections grant administered by the Council on Library Resources. For more information on the project, please contact the project’s principal investigator, Emily R. Novak Gustainis, Deputy Director of the Center for the History of Medicine. The Center is pleased to announce that the records of the Harvard Prevention Research Center (HPRC), 1992-2003, are currently being processed as part of the Bridging the Research Data Divide project. The Harvard Prevention Research Center at the Harvard School of Public Health (as of 2014, the Harvard T.H. Chan School of Public Health), was founded in 1998. The Center works with local, community, and government organizations to research, develop, implement, and refine school- and community-based youth intervention programs to encourage better health habits among youth. Programs particularly focus on improving nutrition and exercise habits, in order to lower the risk of obesity and chronic disease in children and youth. As of 2016, the Center is nested under the Department of Social and Behavioral Sciences. Steven L. Gortmaker (born 1949) serves as Principal Investigator and Director, and Angie Cradock is the Deputy Director. The collection is a product of two research projects and educational interventions developed and implemented by the Harvard Prevention Research Center under the direction of Steven Gortmaker: Planet Health (1995-), funded by the National Institute of Child Health and Human Development, the Centers for Disease Control and Prevention, and a university gift; and the Play Across Boston project (1999-2001), funded by the Centers for Disease Control and Prevention. Planet Health is a middle-school-based wellness curriculum developed for use by teachers and physical education instructors to teach healthy decision-making regarding nutrition, exercise, and leisure activities, while also supporting learning in traditional subject areas. Planet Health records, dated 1992-1997, were developed during the randomized control trial conducted to produce the curriculum, and include: student activity and diet worksheets; teacher and student focus group transcripts and recordings; wellness workshop records; student-made activity graphs; analyzed data; and research administrative records. Play Across Boston was a collaborative initiative with Northeastern University’s Center for the Study of Sport in Society, to survey and evaluate the availability of after-school fitness activity programs for Boston-area youth, and to determine how both access to these resources and individual family characteristics influence youth physical activity. The project surveyed youth participation in 237 programs in the greater Boston area. Play Across Boston records are dated 2000-2003, and consist of: student surveys regarding participation in organized physical activity outside of school hours; and fitness program provider surveys concerning details of program offerings and student participation during the school year and summer vacation months. The collection is expected to be open to research in 2017. Processing of the collection is part of the Bridging the Research Data Divide project, funded by a Hidden Collections grant administered by the Council on Library and Information Resources (CLIR). For more information on the project, please contact the project’s Principal Investigator, Emily R. Novak Gustainis, Deputy Director of the Center for the History of Medicine.